February 1st is just around the corner, so I thought it would be fun to give you a preview of what you can expect with your Inking Everything With Becky membership. I will be previewing 3 cards over the next few days, which is what you will get each morning. Inking Everything With Becky is a brand new membership site that I have developed with my downline team, Inking Everything. Together we are teaming up to bring you an online event unlike anything you've seen before! Here it is - preview #1! My preview cards will all feature the Mixed Bunch stamp set and the new Blossom Punch. I'm looking forward to this Becky! I also loved shopping for SAB so thank you! Thank you for this latest, from you; I can't wait & SAB is one of thee best times, of the year, for me! i'm just curious about one fact with this: i thought the projects on the membership site were not going to be seen anywhere else. so is the card you're showing today one of the cards on the site, or just one showing the punch and set you're going to be working with? This week I am previewing 3 cards to give people an idea of what they can expect with IEWB. At the end of the preview a free tutorial will be available. Members of IEWB are not paying for these projects. Love this card. The punched flowers out of the embossed cardstock are so subtle but beautiful. 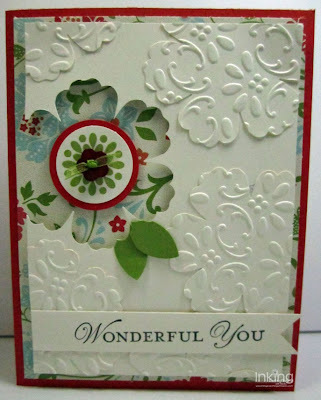 Love the layering affect of the patterned paper flower also. Great work!! Well, got the punch but not the stamp set yet! Why can't ordering be as simple as snapping my fingers and having it appear?! Can't wait to see what the whole IEWB is about!